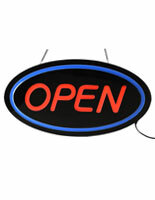 These lit displays, LED open signs with lens are great long term window signage solutions in a variety of businesses. These display units have (3) animated settings for getting customer attention, even from afar. 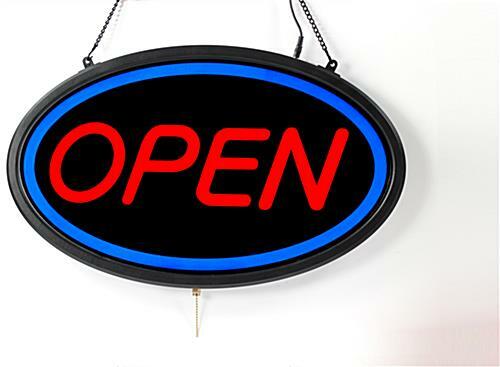 Hang LED open signs, also known as light boxes, in the windows of your stores and the bright lights will shine through the glass onto the street. Marketing tools like this draw traffic into the store, which will boost sales! 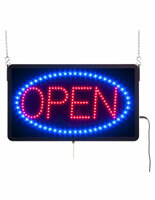 These flashing window displays, LED open signs are simple and lightweight which is ideal for high traffic areas. These units are safe for employee handling since the bulbs are not exposed which reduces the risk of burns. 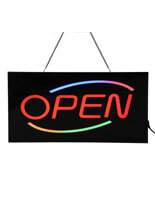 These high-end LED open signs come with two chains and hooks for multiple hanging options. Use one chain to hang the unit from a single point or two chains to hang the display from two different points. 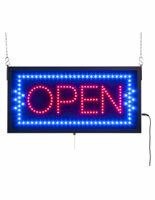 These LED open signs for indoor placement are ideal for communicating to customers that your shop is ready for business. The hanging lit signage features plastic construction with semi-gloss lens and textured matte black frame which heightens visibility. These LED open signs that have shiny backgrounds really highlight the message to catch customers attention. The (3) animation settings which include two flashing options and one still option are great for catering your display to your store's unique style. 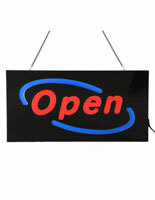 These LED open signs that are retail solutions are excellent for any company with business hours. The lightbox works especially well in places with foot traffic because the unit will be highly visible to pedestrians walking by the company, even from the opposite side of the street. However, these LED open signs that are 22-1/2" wide can also be easily seen by a car, as they are large and bright enough to be seen by drivers moving at moderate speeds. Buy one of these signage units for your business now and start bringing in new customers! 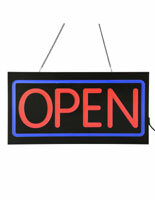 Beautiful OPEN sign. It's bright and has 3 display modes. Clean looking and very professional. We had been searching for an OPEN sign with a pully string for the power and finally found this item. I called the live agent and he was very helpful and let me know that this was exactly the item we needed. Got it in the mail quickly, installation was a breeze, and it works great. Thanks for an awesome product! Thanks for an awesome review, Hoang! We are glad this all worked out for you and hope you shop with us again soon! Thank you for the review, Holly!